PRINCETON, NJ -- Although federal and state health insurance exchanges opened on Oct. 1, 71% of Americans who lack health insurance -- the primary target group for the exchanges -- say they are "not too familiar" or "not familiar at all" with them, little changed from last month. 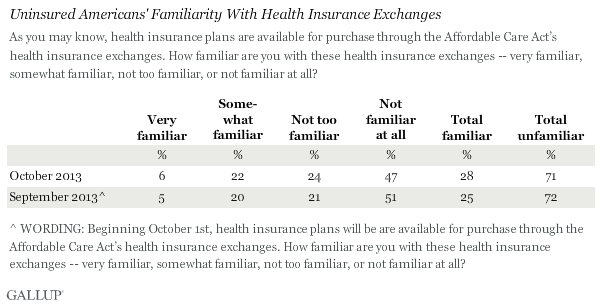 At the same time, 28% of uninsured Americans say they are very or somewhat familiar with the exchanges, up slightly from 25% last month. The exchanges are online insurance marketplaces that allow eligible Americans to find health insurance plans, as required by the 2010 Affordable Care Act. Many Americans have had difficulty signing up for insurance at the exchanges since they opened, due to heavy traffic on the websites and technical glitches plaguing them. It is unclear how many Americans have signed up for insurance since the exchanges opened; the Obama administration has not yet released enrollment figures. Gallup's latest update on Affordable Care Act awareness and knowledge is based on Oct. 7-17 interviews with 702 uninsured Americans. One challenge the Obama administration is trying to overcome in rolling out the exchanges is raising public awareness of the healthcare law and its requirements. While 73% of uninsured Americans tell Gallup they are aware that Americans need to have health insurance for 2014 or pay a fine, 26% are still not aware of this requirement. Awareness of that health insurance requirement -- known as the "individual mandate" -- is up slightly among the uninsured population since September, when 68% were aware. Gallup asked a somewhat different question about the individual mandate in June, and at that time found 56% of uninsured Americans saying they were aware of the insurance requirement. Thus, it appears there has been progress toward universal awareness in recent months. However, with 26% of uninsured Americans still unaware, there is much more work to do. A key to making the Affordable Care Act work as designed is for all Americans to carry health insurance. To ensure this happens, the law stipulates that Americans are subject to fines if they do not have health insurance. When Gallup reminds uninsured Americans of this requirement and asks what they are most likely to do, 56% say they plan to get insurance, while 34% say they are more likely to pay the fine. In September, Gallup found a slightly larger margin in favor of getting insurance than is the case now, 65% to 25%. Gallup estimates that 18% of all U.S. adults are uninsured. Therefore, the 34% of uninsured Americans who are more likely to pay a fine is equal to 6% of the total U.S. adult population. That leaves 12% of the U.S. population who are uninsured and indicate they are more likely to get insurance than pay the fine, or are unsure what they will do at this point. If uninsured Americans who say they are more likely to pay the fine actually follow through on their current intentions, and the remainder of uninsured Americans all get health insurance, then the uninsured rate in the United States could drop by as much as two-thirds. While this would be a significant improvement over the status quo, that would still leave the U.S. quite a bit short of the ACA's goal of universal health insurance coverage. Among those who are uninsured but say they plan to get insurance, 49% intend to sign up for a plan specifically through a healthcare exchange. An additional 15% volunteer that they are undecided or do not have an opinion, leaving 36% who would plan to get insurance through some other means. While Gallup does not specifically ask through what other means respondents might obtain insurance, possibilities include signing up through an employer, buying a plan directly from a health insurance provider, or -- for uninsured young adults -- joining a parent's or spouse's plan. Importantly, uninsured Americans are no more likely to say they will get insurance through a healthcare exchange now than they were before the exchanges opened on Oct. 1. In September, 48% of the uninsured who said they would likely get insurance planned to sign up through an exchange. Oct. 1 marked a major milestone in the implementation of the Affordable Care Act, with uninsured Americans able to find and purchase health insurance plans that would move them out of the ranks of the uninsured and move the U.S. closer to universal health insurance coverage. Of course, the rollout of the exchanges has had its share of issues, and the Obama administration is trying to address these, to allow all who want to sign up for plans now or in the coming months the ability to do so. Gallup's tracking suggests little progress has been made in uninsured Americans' awareness of the insurance requirement or familiarity with healthcare exchanges in the weeks since they have been open. On the positive side, more than seven in 10 uninsured Americans are aware they need to get insurance. However, the same percentage say they are unfamiliar with the exchanges, the primary place uninsured Americans are supposed to be able to find insurance. Results for this Gallup poll are based on telephone interviews conducted Oct. 7-17, 2013, on the Gallup Daily tracking survey, with a random sample of 702 adults who do not currently have health insurance, aged 18 and older, living in all 50 U.S. states and the District of Columbia.